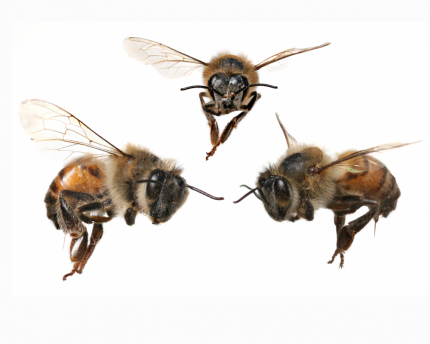 Home » Today » How can we help bees recover? Major declines in populations of bees in North America and beyond are a big problem for farmers who depend on this free natural pollinator to help fertilize crops that end up as food on our tables. According to the nonprofit Natural Resources Defense Council, $15 billion a year in U.S. crops—including apples, berries, cantaloupes, cucumbers, alfalfa and almonds, among others—are pollinated by bees. Meanwhile, U.S. honey bees produce some $150 million in honey annually. While we still aren’t 100 percent certain what is causing the decline across the board for bees, most researchers believe a class of pesticides called neonics (short for neonicotinoids) are at least partially to blame. Designed to eliminate insect pests that most commonly afflict agricultural crops, neonics—which are now genetically engineered right into the crop seeds themselves—are wreaking havoc on so-called “nontarget insects” like bees. And the shifting habitat zones and crazy weather that has accompanied global warming is only exacerbating the bees’ survival issues. Researchers at Michigan State University Extension report that bees especially love to forage on purple, blue, white, yellow, mauve or violet flowers that direct them via markings and patterns unseen by the human eye to a landing pad where they can get pollinating. Find more regionally appropriate plants that will work to attract bees and other pollinators by downloading the free Bee Smart Pollinator Gardener app, which helps users select pollinator-friendly native plants to use in landscaping projects large and small, based on location, project scope, flower color and other options. And be careful about the plants you bring home from the garden store. A 2014 report by the nonprofit Friends of the Earth found that more than half of plant samples purchased at top garden stores across North America contained neonics. NRDC advises to only buy plants or seeds that aren’t pretreated with pesticides and to read the fine print on the label: “If a plant is marked ‘protected,’ that may mean it’s chemically treated.” Patronizing smaller, organic plant nurseries is the best way to avoid neonics.